I'll show more soon - along with a really fun giveaway of fat quarter stacks of the fabric I used - Dessert Party line by Ann Kelle for Robert Kaufman! Stay tuned. Also, make sure to check out the latest tutorial on Melissa's Happy Quilting blog. She made an amazing modern Double Dresden quilt using Veranda. I might just have to make one too! I just saw Melissa's lovely Dresden and commented to myself that I have those same fabrics too and just might have to use them to make a similar quilt. Love those yummy looking cupcakes! I love this! It is darling! 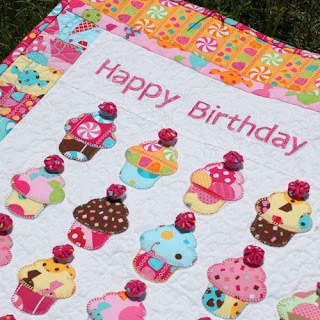 Oh my Amanda the Cupcake Quilt looks yummy enough to eat!! Such a Lucky someone! Now those are cupcakes that even I can have, on my diet! LOL I hope you'll release a pattern for that -- it's adorable! The cupcakes look scrumptious! love them. That is really some love quilt...love the dresdens! Que fome de Cupcake.Deliciosamente lindo,parabéns.